New Yorkers learned last week that their little telephones sometimes have big ears. The police and phone company agents had raided a Manhattan apartment and found a tapping center equipped to eavesdrop on any of thousands of lines into six big exchanges. The raiders made no arrests, seized none of the listening equipment and made no report to New York District Attorney Frank S. Hogan. The incident might have been hushed up but for a civic group called the New York City Anti-Crime Committee, which got wind of the raid and demanded an investigation by the state legislature. Hogan moved in and obtained indictments against two phone company employees and the occupant of the apartment. He sent for the equipment, but it had vanished. What the tappers' motives were--whether for possible blackmail or to get business secrets--was not clear since their victims were a miscellany of citizens. Many New Yorkers wondered meanwhile whether their conversations have been shared in the manner shown in the pictures and sketches on this page. To follow the tapping procedure used, start with Miss Ann Corio and follow the red arrows. 1 One of phones tapped was in apartment of former stripper Ann Corio, who could think of no reason why tappers should be interested. To follow a tap's progress go on with drawing at right. 2 Tapping method believed used is shown in drawing. In the telephone exchange panels, terminal points of tapped phones were connected by feed lines (in red) to wires leading to listening post. Telephone men Walter Asmann (above, left) and Carl Ruh, who worked in the exchange, are accused of tapping. 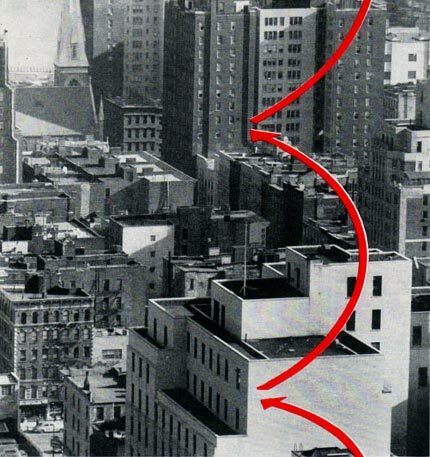 3 To connect telephone exchange building (foreground) on East 56th Street with listening post on fourth floor of East 55th Street apartment house (background) the tappers used spare wires in phone company's underground cable system. But near the apartment, they ran wires from the cable up side of building. 4 Apartment where equipment was found was rented by Warren B. Shannon, an electrician, shown with his wife. The equipment was housed in a small closet and covered by a Venetian blind, as depicted by artist. Monitor listened to conversations to see whether they were worth getting down on tape recorder.